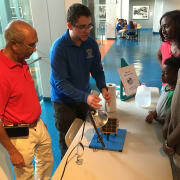 Adult educators volunteering in the Programs department demonstrate science exhibits to visitors, operate rides (optional), handle animals (optional), and assist with science-related educational activities. Ideal for senior citizens, college students, and other adults available during workday hours. If you are interested and available, please contact the volunteer coordinator. Providing a phone number as well as e-mail address is helpful. After contacting us, you will be sent a volunteer application. Please return the application ASAP. *No court-ordered community service applicants, please.